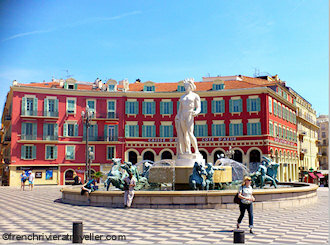 The Place Massena is the heart and soul of Nice as well as its geographic center. Forming a link between cosy Old Nice and the wide boulevard Jean-Medecin, Place Massena is where Nicois gather for any important event. From open-air concerts to the Carnival to a Sunday stroll, it's an extraordinarily convivial spot with statues, fountains, benches and sculpture. Conceived to cover the Peillon river, Place Massena was constructed from 1832 to 1850. The architect, Joseph Vernier, modelled the Italianate porticos that fringe the square on the Rue Rivoli in Paris. The Fontaine du Soleil in the center of the square, contains five bronze statues based on Greek mythology representing Earth, Mars, Venus, Saturn and Mercury. Inaugurated in 1956, the statues and the fountain were removed in 1990, only to be re-installed in 2007 with the arrival of the new tramway. Along with the arrival of Nice's most beloved fountain, 2007 heralded a complete redesign of Place Massena. Vehicules were banned, benches arrived and the towering sculptures of the catalan artist, Jaume Plensa, arose to punctuate the square. 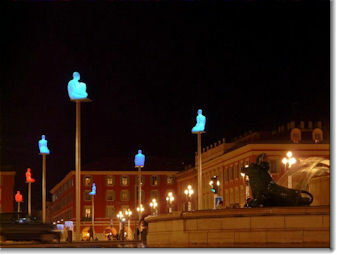 Called "Conversation in Nice", these seven statues represent the continents and are illuminated at night. The Place Massena extends outward to the Jardin Albert 1er, a long, tranquil garden shaded with palms, pines, flowering trees, lawns and fountains. In winter, an ice rink is installed in the center and the rest of the year roller skaters practice their moves. The gardens also contain the Theatre de Verdure, a small concert space.